Check out photos of our Water Well Projects! Helping Meet Your Water Needs! Needing to get a curb well back in use to water the garden or use for the farm? We can help! Don't let the East Texas heat get you down. Call Allstar Water Well Service at 903-218-9028. Water Wells are Our Specialty! 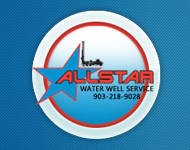 Allstar Water Well is proud to offer reasonable rates and quality service. If you need water for the lawn, garden, or livestock, we can help! Quotes are available upon request.